Tiger Woods PGA Tour 14 improves upon the foundations of its predecessors while offering fans a thoroughly enjoyable trip through the history of one of the greatest games ever played. 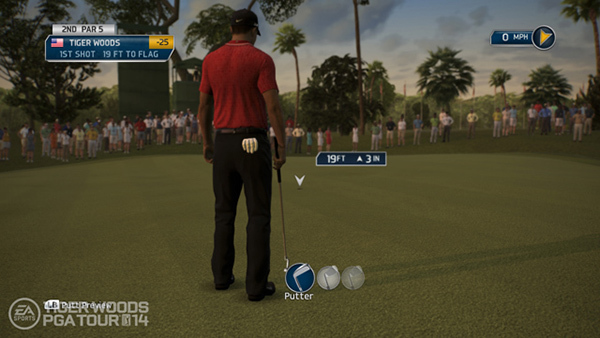 It’s easy to see Tiger Woods PGA Tour 14 as yet another installment to the annual EA Sports title. Yet, after you tee off for the first time it’s clear that the fine adjustments that the developers made have effectively created a much better golfing experience. The game nestles itself onto the green with the perfect conditions to pull in both fans of the series and newcomers alike. It offers gamers the opportunity to seize on a touch of grace they may be unable to achieve with their own set of clubs. 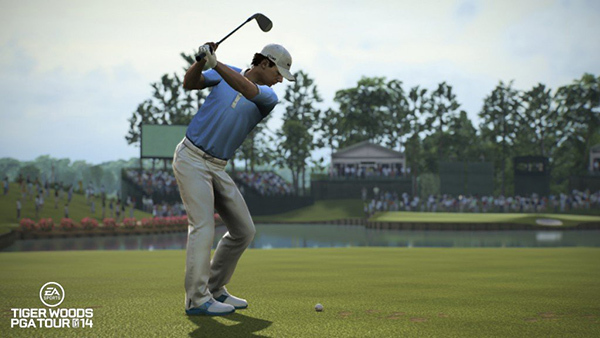 In short, PGA Tour 14 allows you to escape into a fantasy where every skill needed in golf rests in your intelligence, patience, and the grace of your thumbs to send the ball perfectly down the fairway. Jumping into a round of golf with this year’s Tiger Woods grants players a new level of control with their clubs. Shaping each shot is crucial to placing the ball where you want it to land. The tempo of your swing now determines the accuracy of your shot, and places a heavy emphasis on controlling your follow-through on the joystick. This can make it even harder for shots that fall in specific elevations as it now moves the swing meter from left to right, effectively simulating side hill lies. With the improvements to how players control their shots bringing a greater level of control to the core game, it is important to address the dismal Kinect functionality. It would seem that an entire year is a great length of time to improve on what could be the best way to play, but unfortunately the Kinect controls are another missed opportunity. There’s not much reason to even justify their existence. Playing with the controller is still the best way to play, and as much as I wanted to enjoy simulating a round of golf in my living room, the precision required to enjoy it is sorely lacking. 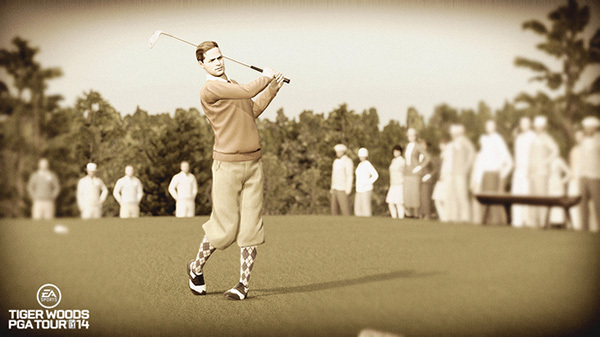 While the Kinect remains a lost cause, one major change comes in the form of the Legends of the Majors mode, which thrusts players back through the history of golf. In the mode, you are tasked with a specific set of goals and missions that directly relate to the finest moments in the history of the game. Each unique time period puts players in the shoes of the best athletes to ever grace the green and it’s a ton of fun to go through it. One of the best aspects of this mode is that players are able to skip between different eras. So, if you aren’t particularly interested in the beginning of Professional golfing back in the late 1800’s, you can skip to a further era. 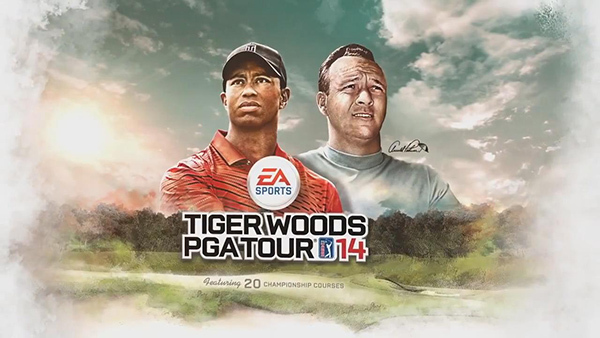 After you have tired of historical match-ups, Tiger Woods PGA Tour 14 offers players the extremely accessible career mode. Creating a character is the first step on your path to fame, but the game offers little in the way of customization. Luckily, a wide range of accessories make their way into the mode for your golfer to equip as you level up. Character creation remains a simple offering that allows players to quickly jump onto the course and prepare for their first tee off. A nice addition worth mentioning is the inclusion of a full-fledged LPGA tour, but this career lacks the same spark that makes the PGA Tournaments so engrossing. Getting started in Career Mode is extremely approachable. Before you jump into any one of the four Major Tournaments, you can access training courses. These provide crucial lessons on the finer points of golf and are one of the best ways to hone your skills. Is it windy? Adjust your loft so that the ball carries itself on the breeze. Playing the course to your advantage is key to progressing towards calling yourself a legend, and the game makes it fun to pursue. Taking advantage of these training sessions allows for players to study the intricate details of what makes golf a sport of precision and grace. Also, equally important is the emphasis of remaining calm and swinging with precision. I can’t tell you how many times I would panic on a crucial shot and then miss. As I approached the ball in shame, I remembered how terribly I performed last time and imagined myself chipping into the virtual green below shouting Happy Gilmore obscenities. Luckily, utilizing pins properly can completely shift your performance from an out of control Gilmore, to a calm and collected Bob Barker. A variety of pins offer the ability to boost your golfer’s performance with things such as 20% better shooting off a lie, plus five to drive attributes and more. Once you use a pin, it is important to remember that you only have a limited number of uses before you are required to purchase more. This can be done through coins earned simply by playing the game. The harder the difficulty you play on the greater the reward you will receive. For those looking for a true challenge I suggest playing on the brand new Simulation difficulty. 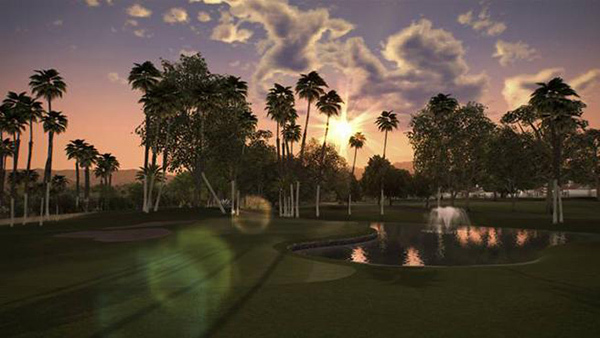 It is a definite must for those looking to join the Tiger Woods PGA Tour Elite. Do you struggle as it is making that perfect shot? Are you not leveling up fast enough? If so, then you can easily make use of EA’s continued tradition of micro-transactions by purchasing coin packs. Luckily, the development team has provided players the ability to earn a decent amount of coins without having to feel that spending money for more coins is a necessity. Better yet, coins can now be used to level your character which makes it even more rewarding to play those last few rounds and gain another level with your golfer. As your character evolves, it is a great experience to see them transition from a beginning golfer to a fully sponsored legend. Visually, each character is represented with great models and animations. The subtle wavering of you characters’ pants creates a soft realistic feeling that brings a sense of calm before each shot. Watching as your ball soars in the air over the fairway is a beautiful sight within the excellently rendered courses and wind will blow the grass into a graceful wave as the camera cuts to a display of the tournament scorecard. The overall presentation of the game makes players feel as if they were truly watching a tournament broadcast. The live stat tracking menu bar in the main menu feels like a hub in ESPN spouting off the newest up-to-date facts about your characters’ performance. The professional presentation even expands into the Legends of the Majors mode where the era of the match-up determines how players view the gameplay. Sepia lenses coat early tournament matches in an effort to help you feel connected to the past, while branching into the early 70’s brings in the beauty of neon. Players are given a visually pleasing presentation that helps to immerse you in the history of golf. Stepping into the shoes of legendary golfers, and creating your own, can only go so far and soon you will find yourself wanting to test your skills against other players. Connected Tournaments bring players together online by combining a variety of Live Tournaments alongside Country Club matches and more. What makes this addition to the game incredibly significant is the real-time golf arc display and live voice chats. It’s an awesome experience to watch multiple shots arcing through the air, and instantly knowing where you stand in comparison to your competition. It’s a phenomenal touch that helps to create a real sense of community. Tiger Woods PGA Tour 14 is without a doubt the best golf simulation on the market. It takes the best aspects of last year’s installment and manages to create a substantial package that is definitely worth your attention. The feeling you get once you sink a hole-in-one and nail a perfect putt on the green is unprecedented. While some may not need to upgrade from last year, Tiger Woods PGA Tour 14 is a great place for everyone else to grab their clubs and hit the fairway.